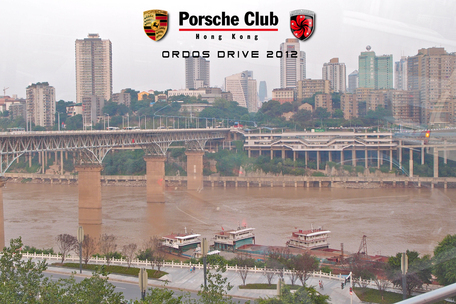 Against the raving feedbacks from Ordos Drive 2011, in mid-September this year, the Club repeated its efforts to organise yet another exciting drive to Ordos in Inner Mongolia. The Drive took place between 15th September (Saturday) and 21st September (Friday). Members first flew to Chongqing (重慶) to attend a dinner reception before heading to Xian (西安), then Yan'an (延安), and finally Ordos (鄂爾多斯) and, in particular, spending two full days at the Ordos International Circuit. Different models of Porsches, ranging from 993s to the latest 991 and including the rare GT2 RS and GT3 RS 4.0, participated. After last year’s dreadful wet conditions, it was refreshing and delightful to be able to drive mostly on dry roads this year. It was such a blessing that there were only a couple minor mechanical problems. 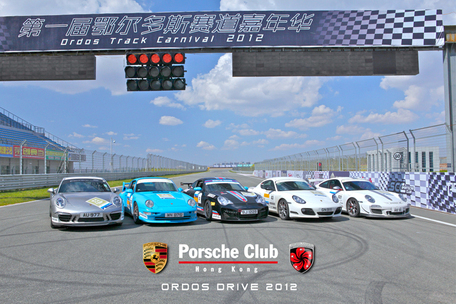 All the cars arrived safely in Ordos. Day 1: Participants gathered at the Hong Kong International Airport and they flew to Chongqing to attend a dinner reception at the Chongqing Tiandi—a residential and retail development of Shui On Land Limited located right by the riverbank of Chongqing. It had been two years since members last went to Chongqing, the area of which they last visited was now completed with all the shops and restaurants opened for business. All the Porsches were washed prior to their arrival, with a few of them displayed throughout the complex for locals to admire. A sumptuous Sichuan feast was prepared for the participants. Soon after dinner, a brief ceremony was held followed by the performance of a local band. Participants were then invited to relax at the newly re-opened Shark bar. Not only was the bar lavishly redecorated, there were now even more large sharks (6 or 7 of them, at least) swimming in the huge tank. Free flow of drinks kept everybody happy and staying late. Day 2: The first day of driving was about 750 km. The Drive headed for a good start when everybody drove through the busy Chongqing city centre and reached the highway without getting separated or lost. There was some light rain initially but it soon stopped and did not cause any trouble like last year. However, members were beginning to get worried when they were travelling on a new section of the highway. According to the road book, there should be several gas stations on that particular stretch of the highway. However, the first gas station that they had passed was still under construction and the second one only offered diesel. They were then informed by truck drivers that there was no gasoline in the next gas station either. With a range of less than 100 kilometres, they were getting really concerned…..turbo drivers were turning off their air-conditioning and coasting in 6th gear at 100 kph in order to save the very last drop of fuel!! The first group in front then decided to leave the highway and head into a small town in search for petrol. The small town turned out to be not as small as they thought. Members later learned that the small town even had some historical significance. A gas station was eventually found. Fortunately, this turned out to be just a slight scare which made the whole trip all the more unforgettable!! Some members even took the opportunity to enjoy a delicious lunch at a small restaurant next to the gas station. Shortly after dark, participants arrived at their hotel in Xian. Some decided to go out to dinner, whilst a few decided to stay put at the hotel for a relaxing dinner. Day 3: This was a short day with only about 390 km of driving. Some members took the opportunity to do a bit of sightseeing in the morning before the departure after midday. The section of highway just outside of Xian was rather interesting. This four lane, 30+ km section of the highway was newly opened with very few cars travelling on it, which was a far cry from the typical highway (often packed with traffic) in China nowadays. Members wasted no time in taking advantage of this traffic-free highway and jokingly said that they would be content just to drive on this section of the highway back and forth!! The rest of the day was incident free and members arrived quite early in Yan’an to relax in the very grand Zaoyuan Hotel which was only opened a few months ago. Day 4: Ordos is only about 400 km away from Yan’an. So members did not have to start early and, yet, still manage to arrive at the Ordos International Circuit by 2 in the afternoon. After all the cars were securely parked in the pits, coaches took the participants back to the hotel. Although no official dinner was arranged, many members fondly remembered the Mongolian feast they had enjoyed the previous year and decided to go back to the same restaurant. They were not disappointed!! Day 5: Most of the participants this year had also participated in last year’s Ordos Drive and they were all keen to experience again the 3.715 km Ordos Circuit. Although it took them some laps to re-familiarise themselves with the track, they all remembered the 18 challenging corners, especially turns 1 and 2, and also, turns 4 and 5 which are particularly tricky as they get progressively tighter and tighter. Despite the challenging corners, all participants thoroughly enjoyed this circuit. Time flew and before anyone realised, it was time to leave. To cap off a very satisfying day, members savoured another delicious Mongolian feast at a different restaurant with Mongolian tents inside it. 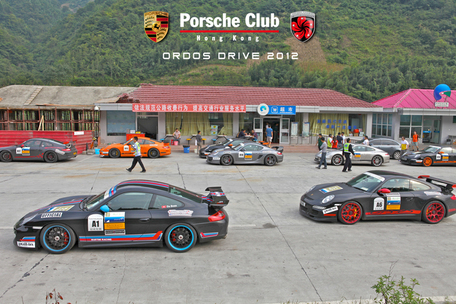 Day 7: Members arranged for their departure back to Hong Kong with most members taking the morning direct flight back to Shenzhen, concluding an adventurous and memorable Ordos Drive 2012.